Book of the Month: The famous and renowned BBC reporter, Nicholas Witchell's, "The Loch Ness Story". An outstanding book - by possibly the greatest researcher to have studied the Loch Ness phenomenon. Q: How long have sturgeon been around? A: They have existed on this planet (and who knows where else?) for some 200 million years. Q: Is there just one species of sturgeon? A: No. It is generally thought that there are twenty four species of sturgeon and five subspecies in existence today. Many of the species are nearing extinction. Q: Do sturgeon live in freshwater or saltwater? A: These fish are anadromous, meaning they can live in freshwater or saltwater. Typically many sturgeon species live in saltwater and spawn (lay eggs) in freshwater (some sturgeon live in freshwater all the time). The chloride cells in sturgeons' gills allow them to survive in saltwater. Q: Can people eat sturgeon? A: Yes. Sturgeon meat is apparently very good, but their most highly valued product is their eggs, which are processed and sold as caviar. The fish have tough skin which can be turned into leather. The swim bladder of sturgeon can be processed into a gelatin called "isinglass", which is used to clarify wine and beer and as a waterproofing material (or in paint and glue). Q: What do sturgeon eat? A: Sturgeon are bottom feeders and will eat almost anything that comes along. Their main diet consists of fish, crayfish, clams, eels (pleny in Loch Ness) and shrimp. Q: What about the history of sturgeon? A: King Edward II of England loved eating sturgeon and he made a law stating that any sturgeon caught in English waters is the property of the British Royal Family. 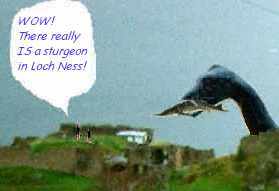 In 1971 the House of Lords eliminated this quaint old law although sturgeon are considered almost extinct in England. In 1933 a salmon angler foul hooked and landed a nine foot 388 lb sturgeon in the River Towy in Wales. It was presented to the Queen. There is another sturgeon being kept in captivity in a pond by a heavily bearded and formally unqualified naturalist living near Loch Ness. It appears from press reports that the purpose is to analyse what tourists think they have seen swimming around the plastic plesiosaur, which is the little pond's main feature. Want to read more about sturgeon?